An Asian-made multimeter, the Fluke 17B+ is an upgrade of the 17B and a model up from the also remade 15B, the 15B+. It comes with several improvements over the original, to include a higher capacitance scale, a Min/Max function and better responsiveness. There is also a temperature input, which the 15B+ doesn’t have. Note: This is a cheaper, Chinese-made Fluke multimeter; not as polished as your typical, American-made Fluke and not really intended to be sold outside of China. Most notably, it lacks refinement and there’s no English hard manual. This is for those that would really like a Fluke but don’t have the budget or can’t justify the extra expense. It mostly works as good as any other of this brand, though you don’t have the super-fast continuity that they are known for, or the high level of refinement and accuracy. Nonetheless, the 17B+ works really well and is sturdily built. As noted, this is a more responsive model than the 17B, with quicker-acting continuity checks and faster auto-range time. It still lags behind standard Flukes on this score, including on the time taken to produce results on resistance and capacitance ranges. Of capacitance, the range is extended out tenfold to 1000uF, enabling the diagnosing of larger capacitors. In addition is the inclusion of Min/Max mode. This in itself is a boon over the older meter, and over the newer 15B+. Min/Max is for monitoring and picking up discrepancies in a given signal, being able to pinpoint (and hold) low and high spurts over time. You also get a Relative mode. This function can compare a value you’d previously stored from a given signal. It will also let you zero out the resistance in your leads before performing measurements for more accurate results. You can also measure duty cycle / frequency when checking the current / voltage in a circuit. Also notable is the size and weight of the 17B+, being both heavier and bigger than the original. It measures all standard ranges – voltage (1000V), amperage (10A down to 400μA), resistance (to 40MΩ). Millivolts, milliamps, and micro-amps are on separate dial switch positions and can measure in both AC and DC. Capacitance and temperature also have their own positions, though this unit can only display in degrees Celsius, which may irk some imperial aficionados. The 17B+ is Average RMS only as opposed to True RMS. This only really matters when one needs more accurate measurements of AC drives and variable voltage systems etc. It’s not as well finished as a Fluke 77IV, for example, but the overall build of the Fluke 17B+ multimeter is good. It feels sturdy and will take some abuse, such as drops and bangs. The robust case is trademark yellow, albeit minus their logo. On the rear is a tilting bail (kickstand). The circuit board has been upgraded from the 17B+ and the dial can be used with one hand. Savings have been made to the construction of the test leads, which are PVC, but you can’t have it all. Display: It is backlit and large, but is perhaps not as clear or bright as the American-made Flukes. You get a 4000-count resolution, which is pretty much standard at this price range. Other brands versus price range may beat this meter on speed, being timely to latch on continuity (though not scratchy). Linemen would be better served going for a quicker model, with resistance and capacitance also taking time. The circuit board has been redesigned and features better protection, with MOVs. It also has good quality high rupture capacity type fuses, which are rated to 11A and 440mA (of the two current inputs). The meter is protected to CAT-III, so you can safely check most systems behind the switching gear of a building installation. Surge protection is to 6kV. Mechanically; it is tough with a rubberized holster and has an IP rating of 40. 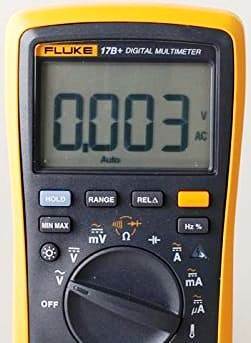 The Fluke 17B+ digital multimeter has received mostly positive feedback in the world of electrical testing gear. It is great value for money considering the brand and despite being put together in China. It does suffer on speed, as do most meters sub-$200, and also only has instruction in Chinese. It is not True-RMS, but is good for starters and for those looking for a backup. Overall, it is good value for money. Alternatively: The 18B+ has more features again, or you could save a bit and go with the 15B+ if you don’t need temperature or Min/Max. For other, cheaper Flukes, consider the compact 110 Series, which are slightly more refined (albeit still built in China). The Fluke 117 also has a non-contact voltage detector, for example.